You are currently browsing the tag archive for the ‘cooking’ tag. Food waste is a big problem in Australia. On average, we throw out one in every five bags of groceries! Throwing out that much food is incredibly wasteful, not only in terms of the money spent on purchasing the food, but also the amount of energy and resources used to produce the food. Consider the amount of water, fuel and fertiliser needed to grow, harvest, transport and process all that food! So in an effort to reduce waste and be kinder to our hip pocket and the environment, here are four ideas on how to use leftover roasted vegetables. 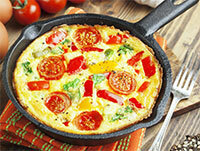 Prepare the frittata mixture by whisking together 6 eggs, ½ cup cream and ¾ cup parmesan cheese. Place the leftover roasted vegetables in a greased frying pan and pour in the mixture and top with 1/3 cup torn basil leaves. Cook for 8-10 minutes on low heat until almost set before placing the mixture under a preheated griller on high for 3-5 minutes or until golden brown. Whisk together 1 tablespoon oil, ½ cup lemon juice, 2 cloves garlic (crushed) and 2 teaspoons sugar in a jug and pour over warmed leftover roasted vegetables and 1 can (400 gram) chickpeas. Add 2 tablespoons of parsley and toss gently to combine before serving. Add leftover roasted vegetables to 2 cups cooked cous cous, 1 can (400 gram) lentils (drained and rinsed), 250 grams grape tomatoes (halved), 2 tablespoons currants and a handful (approximately 60 grams) baby spinach. Drizzle over with ½ cup plain yoghurt mixed with 2 tablespoons lemon juice before serving. Spread pizza sauce on pita bread , add leftover roasted vegetables and top with mozzarella cheese and herbs before placing in 220oC oven for ten minutes. Top with spinach before serving. What ideas do you have for using leftovers? Boy, it has been hot! Summer has definitely arrived, and brought along with it record-breaking temperatures. We, The Food Book Team, have not only been looking for ways to cool down, but also ways to make your summer eating pleasurable. Nobody wants to be slaving over a boiling stove for hours in a 40 degree day, so if you are looking for recipes that will help you stay cool and not heat up the kitchen, think about making some frozen treats like icecream or sorbet. There is a delicious recipe for Easy Icecream on p. 335 of The Food Book – just add some flavouring ingredients at step 3 to add your own personal twist, we’ve been enjoying some icecream with chopped mango and mashed banana. What ideas do you have for frozen treats to keep you cool in summer? We’d love to hear it! However, if you do have to cook, the trick is to cook early in the day when it is cooler, keep the meal in the refrigerator until you are ready to eat and then use the microwave to heat it up. Frittatas are a good idea during the heat, they can be made early and served warm or at room temperature. The Vegetarian Frittata on p. 140 of The Food Book makes a deliciously light meal for a hot evening, especially when served with a fresh garden salad (try the Green Garden Salad recipe on p. 205). If it is simply too hot to cook, then consider using fresh seasonal produce to make delicious, yet substantial salads (so you do not wilt in the kitchen). 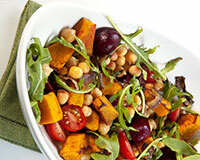 The Food Book has lots of easy-to-prepare salads you could try. Tabbouleh (p. 212) is full of fiber and bite – burghul can easily be substituted for quinoa for a bit of variety. 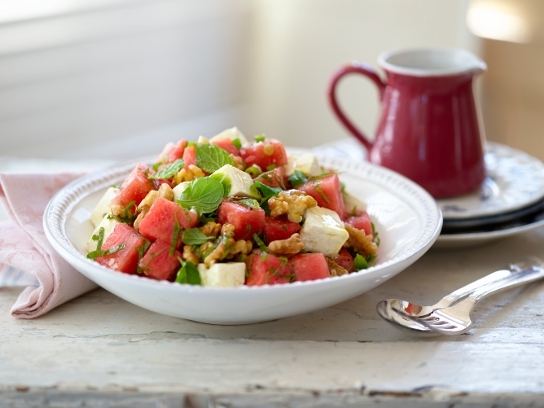 The delightfully refreshing Watermelon and Feta Salad (p. 208) is perfect for that hot summer day – the salty creaminess of the feta and the toasted crunch of the walnuts are the perfect match for the sweet, juicy watermelon. What ideas do you have for quick summer meals? Enter your email address then click the 'Sign me up!' button to receive notifications of new posts by email.